Like me, my companions in this adventure were lovers of wilderness, and many of the remote places we intended to explore were essentialy roadless. Our plan was to ride until we couldn’t, and then hike, scramble and climb to our destination, traveling on foot as light and fast as we could on our stripped-down motorbikes. 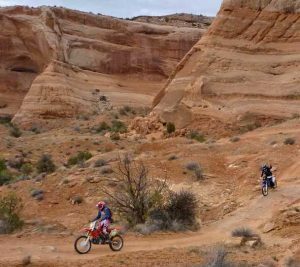 Save for the obvious carbon footprint and the knobby tracks in the soft sand, our multi-day, two-wheel adventure ride would adhere to the Leave-No-Trace ethos championed by backcountry bipeds. We would be heard, seen, and then gone. Yes, you can love and respect the land and use various forms of powered vehicles to explore the back country. The issue for me is that motorized and non-motorized back country travelers need separate places to recreate. We need roadless areas and wilderness, but there are also areas which can be designated for motorized use. 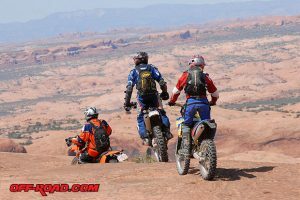 As a hiker I do not wish to hike into one of my favorite places and find motorcycles or 4wd vehicles making more noise than I do when hiking. By the same token, I do not want to ride my adventure bike in places where I would feel guilty disturbing non-motorized folks. With cooperation we should be able to set aside areas for everyone to be able to enjoy the back country in what ever methods of transportation they choose. We all have some impact when we decide to go into the back country. I concede that most times motorized use has more impact than non-motorized and needs to be regulated to insure the impacts do not destroy the places we love. But I believe it is not wise for one group to attempt to ban or outlaw another groups ability to access the back country. (The previous comments) are excellent and perhaps more congenial than mine. As a long-time motorcycle enthusiast, I was also raised by a very conservation-minded wildlife management Ph. D who correctly believed that motorized vehicles, particularly two-wheelers, damage the terrain and induce and magnify erosion (read: tear up the land). The peace and quiet of these expansive ancient lands need not be adulterated by the sound of motors and the hipsters astride them is where I fall down on this. In contrast to (the elitist view) I’m ok with sharing some of the expanses of America’s PUBLIC lands with people that enjoy a variety of means of transportation. Tolerance and diversity come in many forms.